Clinicians at the Wildlife Clinic of the Cummings School of Veterinary Medicine at Tufts University released a Cooper’s hawk today, as the bird was deemed fully recovered from a shoulder fracture. The release took place at 10:30 on Monday near the Bernice Barbour Wildlife Building at 200 Westboro Road in North Grafton. Massachusetts Senator Steven Panagiotakos, chairman of the Ways & Means Committee, phoned in a call about a bird in distress when he saw it flapping its wings and trying to cross a busy Lowell intersection on February 23. Animal Control Officer Robert Pickard caught the hawk near the intersection of Appleton and Gorham Streets. Pickard relayed the bird to Massachusetts Environmental Police, who brought it to the Cummings School on February 25th for examination, treatment, and rehabilitation. The adult male Cooper’s hawk—believed to be born in the spring of 2007—was treated at the Cummings School’s Wildlife Clinic for a fracture of its right coracoid, part of its shoulder joint. An old fracture of its left wrist proved not to impede the hawk’s normal abilities. Because of the location of the bird’s fracture, it was not known initially whether it would be able to fly well enough to be released to the wild, according to Florina Tseng, DVM, director of the Wildlife Clinic at the Cummings School. However, the bird soon regained its ability to fly and soared quickly away after its release Monday. Senator Panagiotakos checked in often on the bird’s progress—and even requested that the clinic name the bird Aiello, after the park and coffee shop in Lowell. What’s more, Sen. Panagiotakos, who has a lifelong interest in hawks, had originally planned a ceremony in Lowell for the hawk’s release. However, when Cummings School clinicians advised the senator of the dangers that transporting the hawk to Lowell might pose to the newly rehabilitated bird, he canceled the ceremony so that the bird could be released more safely from the Cummings School’s North Grafton campus. 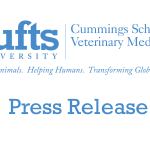 Senator Panagiotakos has long been a friend of the Cummings School of Veterinary Medicine, and we are pleased that we have a happy ending for this story he is so closely associated with, said Deborah T. Kochevar, DVM, PhD, dean of the Cummings School. His involvement with Aiello’s treatment and recovery shows a deep passion for wildlife, and we have truly enjoyed working with him. Dr. Kochevar went on to say that Sen. Panagiotakos and the other bystanders who originally saw the injured bird in Lowell acted appropriately when they encountered an injured wild animal—called the police, watched from a distance, and did not try to touch the animal. Prior to release, clinicians at the Cummings School affixed a band from the Massachusetts Department of Fish and Wildlife to the hawk’s talon so that it can be tracked in the wild. Housed in the Bernice Barbour Wildlife Medicine Building, the Wildlife Clinic at the Cummings School treats more than 1,500 animals each year, and serves as a regional resource for many veterinarians, health professionals, and wildlife biologists. Skills and knowledge are exchanged through programs of cooperative teaching and continuing education. The clinic contains all the latest diagnostic, medical and surgical capabilities to house and treat a broad range of sick and injured native wildlife. 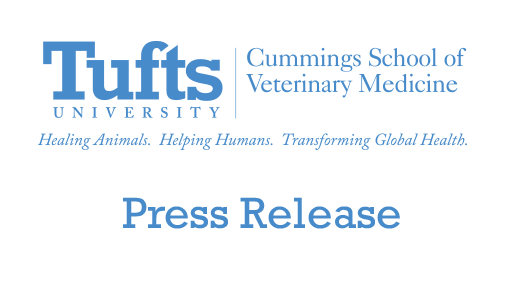 All veterinary students at the Cummings School are required to do at least one rotation at the clinic.